UNITED NATIONS (Reuters) - U.S. Secretary of State Rex Tillerson warned on Friday that failure to curb North Korea's nuclear and missile abilities could lead to 'catastrophic consequences,' while China and Russia cautioned Washington against threatening military force to solve the problem. While Washington has pressed Beijing to rein in its ally Pyongyang, Chinese Foreign Minister Wang Yi told the U.N. Security Council that "the key to solving the nuclear issue on the peninsula does not lie in the hands of the Chinese side." Tillerson urged the 15-member body to act before North Korea does and called on states to sever diplomatic and financial ties with Pyongyang. He said that because China accounted for 90 percent of North Korean trade, its role was particularly important. 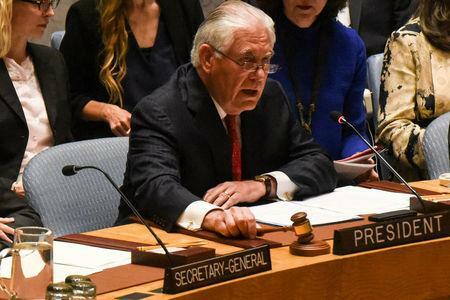 "Failing to act now on the most pressing security issue in the world may bring catastrophic consequences," Tillerson said in his first remarks to the council as secretary of state. The United States was not pushing for regime change and preferred a negotiated solution, but Pyongyang, for its own sake, should dismantle its nuclear and missile programs, he said. "The threat of a nuclear attack on Seoul, or Tokyo, is real, and it's only a matter of time before North Korea develops the capability to strike the U.S. mainland," Tillerson said. While Tillerson repeated the Trump administration's position that all options are on the table if Pyongyang persists with its nuclear and missile development, Yi said military threats would not help. Yi said dialogue and negotiations were the "only way out" and called on parties to stop arguing over who must take the first step. China wants talks first and action later, while the United States wants North Korea to curtail its nuclear program before such talks start. "The use of force does not solve differences and will only lead to bigger disasters," Wang told the council. U.S. President Donald Trump said in an interview with Reuters on Thursday that a "major, major conflict" with North Korea was possible over its nuclear and ballistic missile programs. Russian Deputy Foreign Minister Gennady Gatilov also said on Friday the use of force would be "completely unacceptable." "The combative rhetoric coupled with reckless muscle-flexing has led to a situation where the whole world seriously is now wondering whether there's going to be a war or not," he told the council. "One ill thought out or misinterpreted step could lead to the most frightening and lamentable consequences." Gatilov said North Korea felt threatened by regular joint U.S. and South Korean military exercises and the deployment of a U.S. aircraft carrier group to waters off the Korean peninsula. China and Russia both also repeated their opposition to the deployment of a U.S. anti-missile system in South Korea. Gatilov described it as a "destabilizing effort," while Wang said it damaged trust among the parties on the North Korea issue. Japanese Foreign Minister Fumio Kishida told the council that to bring North Korea back to the table the international community "must send a strong message that provocation comes at a high price." "There is no doubt that dialogue is necessary ... however under the current situation where North Korea continues to advance its nuclear and ballistic missile programs, meaningful dialogue is clearly not possible," he said. The Trump administration is focusing its North Korea strategy on tougher economic sanctions, possibly including an oil embargo, a global ban on its airline, intercepting cargo ships and punishing Chinese banks doing business with Pyongyang, U.S. officials told Reuters earlier this month. Since 2006, North Korea has been subject to U.N. sanctions aimed at impeding the development of its nuclear and missile programs. The council has strengthened sanctions following each of North Korea's five nuclear tests.